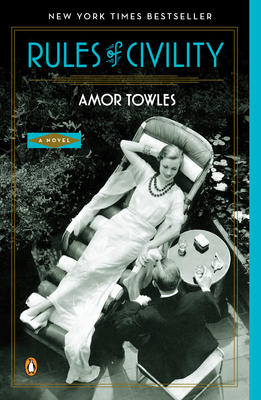 Last year, I couldn't stop raving about the debut novel RULES OF CIVILITY by Amor Towles. It really is a beautiful story and perfect for book clubs -- you can read my review here. Time sure does fly because it's already time for the paperback release of this wonderful novel. Two (2) grand prize winners will receive this marvelous basket of goodies valued at $500 along with one copy of the new paperback edition of RULES OF CIVILITY. The gift set includes two Tiffany “art deco” martini glasses, a cocktail shaker, a beautiful women’s broach and men’s pocket watch, Tiffany playing cards, three of F. Scott Fitzgerald’s Penguin Classics hardcovers, a selection of great music from the 1930s, and more. Twenty-five (25) runners up will each receive one copy of the new paperback edition of Rules of Civility. Enter by Tuesday, July 3, 2012, for your chance to win! I have been wanting to read this one ... and no, I don't have a copy. I've been wanting to read this one. Almost bought it in the airport the other day, but I grabbed the Tom Perretta book instead.